The grounds of St. Theresa of Avila Church in Gonzales were a festive and colorful display of pop up tents and banners as the parish celebrated its history of being in the heart and heartbeat of the community for the past 100 years. St. Theresa marked its centennial with a special celebration that included Mass on Oct. 14. The roots of St. Theresa date to the mid-1800s, according to historical records. For many years, settlers of the east bank of Ascension Civil Parish traveled across the Mississippi River to Donaldsonville or up the river to St. Gabriel Church in St. Gabriel. Because of the inconvenience of crossing the river, French and Spanish settlers built a chapel named St. Ann at Crevasse near Belle Helen in 1840. By the late 1840s another chapel was built at Cornerview. 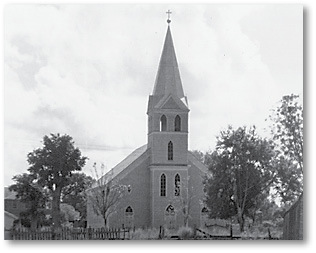 In 1863, a larger church was procured in Cornerview and officially established as a parish under Our Lady’s patronage about four miles from the present church. The church was renamed Sacred Heart at Cornerview. For the next 50 years, priests from Cornerview served the people of Gonzales. As the town’s population grew as the railroad line from Baton Rouge to New Orleans expanded, and River Road and the new Airline Highway cut through Gonzales, a declaration was made to transfer the church from Cornerview to Gonzales. The Cornerview church parishioners signed a protest letter to Archbishop James H. Blenk SM of New Orleans, according to Colleen Lambert, who is researching the history of St. Theresa and Ascension Parish. The original St. Theresa church, which was 40 feet away from the current church, was 116 feet long and 60 feet wide, and the steeple was 106 feet high, said Lambert. According to Purvis Hebert, another long-time member and historian, the church was built by parishioners. The church was poorly built and after 20 years it became apparent a replacement building was necessary, as the steeple was about to fall down. “It was the ugliest church in the world for about 15-20 years – not a pretty site,” said Hebert. Even in the midst of World War II, money was saved to build a new church. In 1953, Archbishop Joseph F. Rummel dedicated the present church on the feast of Christ the King. The cost of the church, including furnishings, was $161,654.13, according to Lambert. Hebert said St. Theresa is a special parish in the midst of a town with a heart of service. “We have quite a community outreach,” said Hebert. This honoring of the past and building of its future permeated the church’s centennial celebration, which highlighted the intertwining and converging histories of the church, community and state. 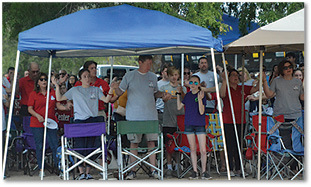 The celebration kicked off with an outdoor Mass. In recognition of the contributions of the Hispanic community, the second reading and some of the prayers and music during Mass were in Spanish. In his homily, pastor Father Eric Gyan said St. Theresa faithfully carries out the mission Christ conferred to his disciples. There are those moments for people after experiencing a milestone in their lives, such as marrying or becoming parents for the first time, when they think “Oh my goodness” when they realize the responsibilities God has entrusted to them, he said. For Father Gyan, this moment came after he was ordained a priest and realized his role was to help guide souls to heaven. As he thought “how am I going to do this?” God reminded him that it is not being original or creative, but faithful, that is important. He said being faithful is something St. Theresa parishioners have done for many years. “The faith you have been blessed with, the faith that you are living, the faith that you have been handing on for generations, has been given to you by the Lord,” said Father Gyan. At the conclusion of Mass, Father Gyan was presented with proclamations declaring Oct. 14 as St. Theresa Church of Gonzales Day signed by Gonzales Mayor Barney Arceneaux and Ascension Civil Parish President Kenny Matassa as well as commendations signed by Gov. John Bel Edward and leaders of the Louisiana House of Representatives. Many of the event attendees expressed the close bond between their families and the church, which for some, go back generations. “This has been home for us, this is our church family,” said Lessie Gautreau, who grew up in the parish, attended St. Theresa School and received all the sacraments along with her siblings there. Her mother, Catherine Gautreau, 75, also received the sacraments at St. Theresa. Gautreau remembers the old church did not have air conditioning and that it was made of wood. She said there was an atmosphere of dignity and respect when she attended Mass with her parents and grandparents. “It was very Catholic and very simple in those days,” said Gautreau. She recalled being part of the first confirmation class at the “new church.” She went on to work with the youth and RCIA programs. Even as Gonzales expands, Gautreau said there are a group of people who still remember the small town feel of the community and the church. “If you don’t look at the traffic you feel like it’s a small town,” said Gautreau. Ruth Hanson said when the church was moved to Gonzales and Social Security came into existence many of the older people sold their homes and moved to Gonzales to live near the church. “There was a big migration when the church came here,” said Hanson. All of her mother’s family and most of her father’s family are buried at St. Theresa. Olivia Navarro, a seventh-grader at St. Theresa Middle School, said she enjoys St. Theresa’s upbeat messages and music at the Masses. “It keeps people more in tuned and focused on the Mass,” said Navarro, who sings at the Masses every other week. Jessica Breaux said the St. Theresa community is important in keeping her children, Laneigh, a seventh-grader at St. Theresa Middle School, and Libby, 2, close to Christ. “I want the church community to grow and prosper and stay close-knit. That’s what I love about St. Theresa,” said Breaux.